Some very exciting news! Wythall Radio Club are sponsoring a new UHF repeater for our local area. GB3WL, if approved by the authorities, will serve Wythall and the surrounding areas as well as large parts of South Birmingham, Redditch & Solihull. Other local areas out towards Stratford-upon-Avon and Warwick, including parts of the M42 motorway currently not well served by other repeaters, will also get coverage. The repeater workings are all but complete and will be on show at the Wythall Radio Rally on Sunday 9th March, just 10 days or so away. A team of members has been working hard behind the scenes on this project and we are very excited about the prospects for this unmanned relay station in providing communications across the area for all local Radio Amateurs, members and non-members alike. 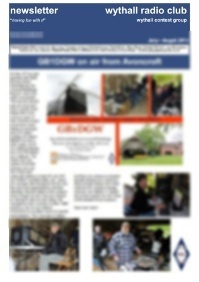 Why not come along to the Wythall Rally and see it “in the flesh”? You can read more about it here. Having fun with RF with the FUNcube! One of the lesser talked about aspects of the great hobby that is Amateur Radio is that of Satellites. For many years, Amateur only satellites have travelled around the earth providing world-wide contacts for those of us more earth-bound. 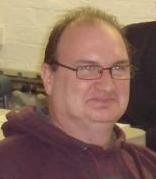 And this Tuesday, the members of Wythall Radio Club are to get genned up on the very latest information – that’s because AMSAT-UK member Dave G4DPZ is visiting us to talk about the FUNcube project. This is one of the most innovative projects in recent years. Launched by AMSAT-UK, the project has created educational “CubeSats”, just 10cm in size, which are intended to enthuse, excite and educate young people about radio, space, physics and electronics. The primary mission is to provide downlink telemetry that can be easily received by schools and colleges for educational outreach purposes. The project includes the development of a simple and cheap ground station – the ubiquitous FUNcube Dongle, a USB dongle which will receive signals direct from the satellite and transfer the data to specially developed graphical software running on any Windows PC. Wythall Club members have been buzzing about this visit for some time and we are expecting a large turnout this Tuesday. Visitors are as always very welcome but turn up early to get a seat! 2030 in the Darts Room at Wythall House, Silver Street B47 6LZ. We look forward to seeing you there. 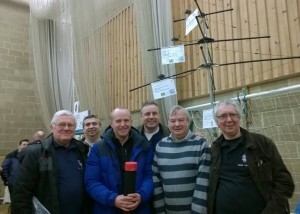 We are very lucky in Wythall Radio Club, in that we have several members who seem to be well known in the amateur radio world in the UK. One of those is Dave G3YXM, who writes the regular LF column for the Radio Society of Great Britain’s monthly journal RadCom. 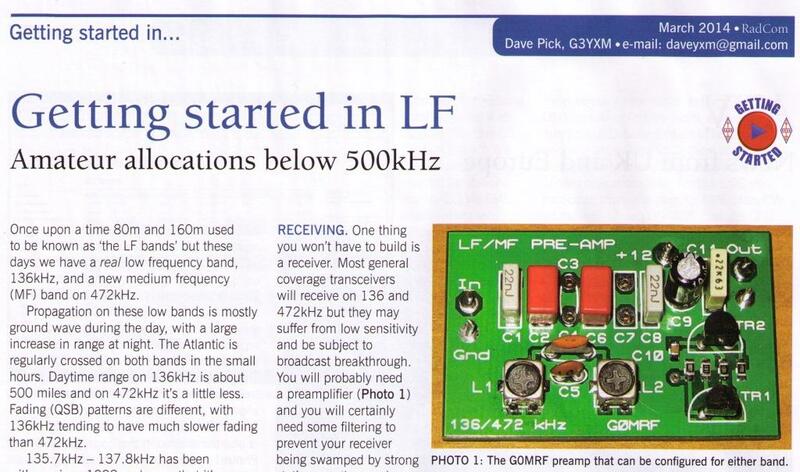 However for the March edition, Dave has written a very informative article for the “Getting Started” series on how to get on the air on the LF bands. These bands are often used by experimenters in the hobby as there is precious little commercial equipment or antennas available. 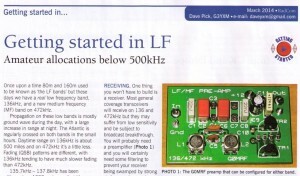 With 472kHz having been made available as a new band to UK hams only recently, there has been an upsurge of interest in LF operation, something in which Wythall member Dave is one of the UK’s experts. All the members of Wythall Radio Club congratulate Dave on an excellent read – of course, we were lucky enough to have the talk in person that preceded the article, so to some degree, we’ve heard it all before! This Tuesday evening will be a very special one for the members of Wythall Radio Club. It is with great pleasure that we welcome Graham Coomber G0NBI, the General Manager of the Radio Society of Great Britain. Graham has not been in his new post for very long but, since he is a relatively local lad (he lives in Bromsgrove), a visit from him was always going to be high on Wythall Radio Club’s “hitlist”. 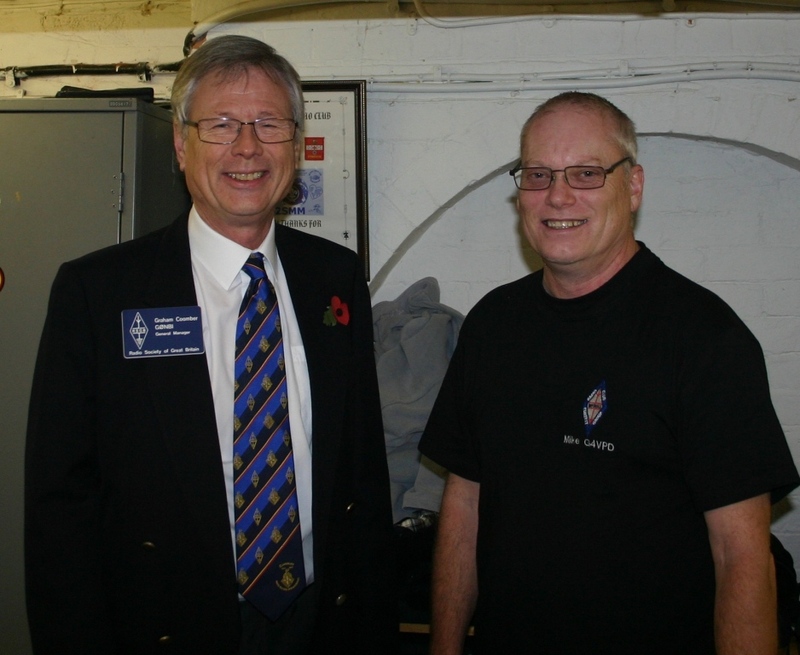 It will not be the first time that Graham has visited Wythall Radio Club as he was one of our special guests last November at our highly acclaimed activation of the G100RSGB call sign, celebrating 100 years of the RSGB. It was there that he met up with the Financial Secretary to the Treasury, Sajid Javid MP and was seen forging some useful links with government! Wythall Radio Club is a passionate supporter of all that is good about the RSGB and we are looking forward to having Graham (and his wife Von) with us this week. Tuesday evening, 18th February at 2030 in the Darts Room at Wythall House, Silver Street, Wythall. B47 6LZ. Feel free to join us there. Little room left at Wythall Radio Club Rally! 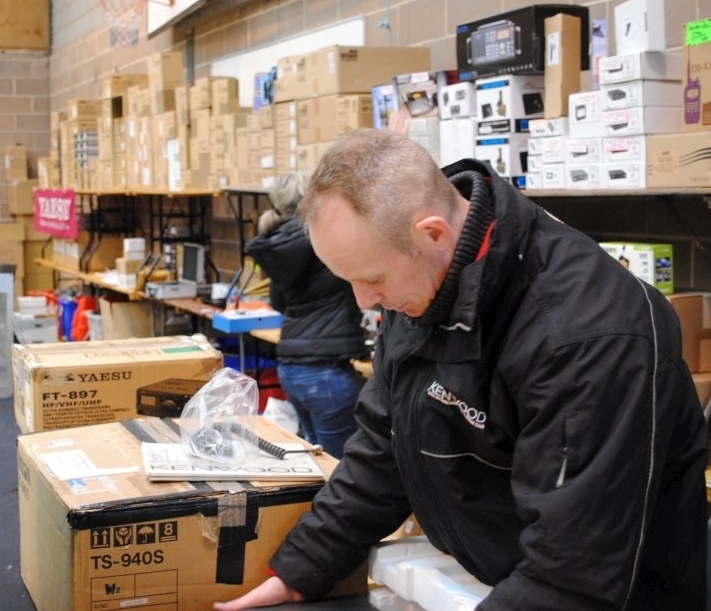 Traders, get your bookings in quickly – there is not much room left at Wythall Radio Rally for 2014! Radioworld, probably the busiest stall at Wythall 2013! That is the message from Wythall Radio Club’s organising team. 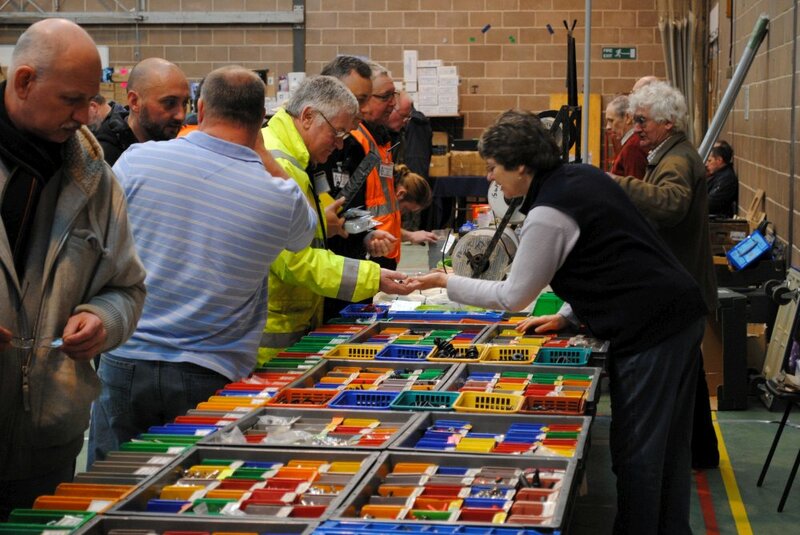 Club President & Rally Organiser, Chris Pettitt G0EYO spoke at our latest planning meeting, telling members that there were only a few tables left for hire and that traders will now have to be very quick to get one of the few remaining places. The lads from Sandpiper Aerials enjoyed 2013’s rally! Club members are now enthusiastically preparing to receive our regular welcome visitors & friends, such as Dave Hayward and his family from Radioworld, the boys from Sandpiper Aerials, and W H (Henry) Westlake, to name just a few! Wythall Radio Club’s annual Radio and Computer Rally takes place on Sunday March 9th at Woodrush School, Shawhurst Lane, Wythall. B47 5JW. Now close to its 30th year of existence, it is fast becoming one of the longest remaining events of its kind in the Midlands or indeed the country! Click on the photos to see larger versions and put the date in your diary – it is going to be a year to remember! Wythall Radio Club is proud to welcome yet another member into the ranks of the Advanced Class of license. This time is the turn of Darren (formerly 2E0LPD) who heard earlier today that he has passed the Advanced Exam. 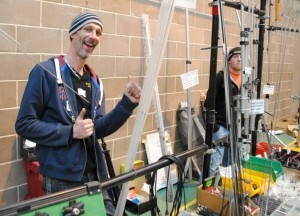 Darren is now the proud owner of the callsign M0WYH. All the members of Wythall Radio Club congratulate Darren on his fantastic achievement! Remember to click on our Training Pages if you are interested in taking a Radio course with us at Wythall Radio Club. 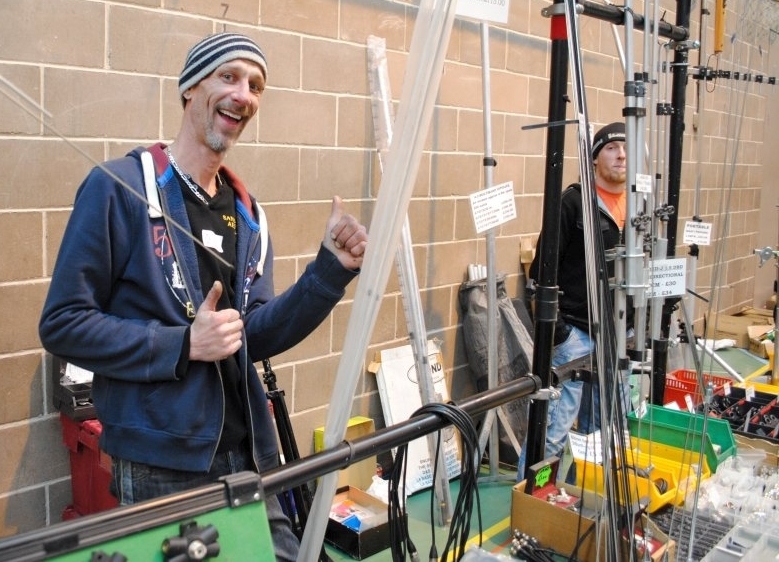 We run courses all year round and you could be our next “Darren”! A Grand Day Out at Harwell! While all Wythall Radio Club members are eagerly looking forward to our own Radio Rally on Sunday 9th March, we also like to support and visit other clubs’ events too. 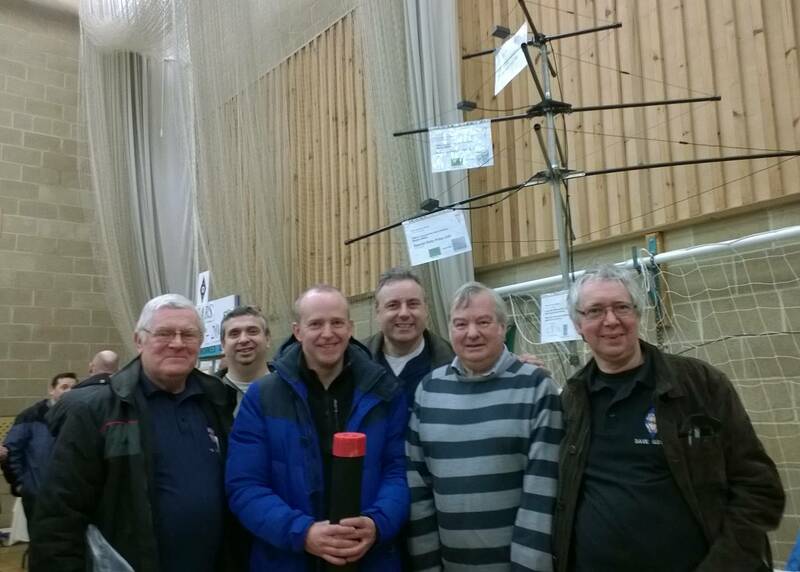 Today was one such, the Harwell Radio Club Rally at Didcot Leisure Centre near Oxford. Six of us made the trip – three, Dave G3YXM, Phil 2E0WTH & Chris G7DDN travelled together in one car in convoy with Simon G4TVR in his BMW(!). John M0JMM & Ian M0IDR travelled separately as they live nearer the venue! A great time was had by all, chatting with traders, meeting old friends, making new ones too like the folks at Alton Antenna Arrays and Sinfully Sweet. Of course we just HAD to spend a little hard-earned on some nice radio goodies! This was all topped off with a sit down and a chin-wag over a pint at lunchtime. A great way to spend a Sunday! And of course an excellent taster of what is to come on March 9th, a date you will just NOT want to miss! Wythall Radio Club Rally is coming! Now we are into February, the thoughts of Wythall Radio Club members start turning to our annual radio rally. Henry Westlake did a good trade at last year’s rally! A rally, or “hamfest” as our cousins in North America might call it, is a festival of all that is good in the hobby. Traders come along and turn a local venue (in our case, two halls of a local high school) into a marketplace of goodies for local amateurs to buy to enhance our fun in the hobby. In the West Midlands, Wythall Rally is one of only two left running and is the nearest to the UK’s second city, Birmingham. Needless to say, putting on this event takes up a lot of our thoughts & efforts in the run up to the event, which this year is on Sunday March 9th. Why not get your hands a little dirty this year and come and join the fun? This Tuesday at 2030 in the Club Shack, Wythall House, Silver Street, Wythall. B47 6LZ. You will be very welcome!